A touch of class that will not disappoint at a price that will not leave you high and dry. Superb build, design and sound that will accommodate any player. Sigma wasn’t given its legendary status, it crafted it for itself. For just under half a century, this guitar company has produced some of the finest acoustics available on the market at a reasonable price. Simply put, its guitars will break your heart and not your bank account - music to our ears. Proudly established back in 1970, Sigma was the answer to the woes of guitar manufacturers across the US during what was a rather worrying time. Companies across America were hit hard by Japanese competitors who saturated the market with guitars that had all the hallmarks of American design, only to be sold at a fraction of the cost. The gauntlet had been thrown down and on the vanguard stood Sigma. Originally created by Pennsylvanian natives CF Martin & Co, Sigma embraced Japanese craftsmanship instead of turning their noses up to their rivals. There was no corner cutting here, Sigma set out to create guitars of an exceptional standard that were then shipped to the US for inspection to guarantee quality. Over the next four decades, Sigma remained modest in its success, letting its guitars speak for themselves. And in 2011 the German music company AMI bought the Sigma name after the line discontinued in 2007. This month we have the GJA-SG200 guitar. Beautiful doesn’t cut it – this is a truly exquisite acoustic. Right off the bat, unboxing the SG200 is an experience we’re not likely to forget anytime soon. With its grand jumbo body, gloss sunburst finish and golden hardware we’re not sure as whether to play it first or take it out to dinner. The SG200’s seductive sunburst colour scheme is a characteristic found throughout the SG line. Slightly brighter than its counterparts, this guitar makes it known early on that it’s the head honcho of the group. Unlike Sigma’s SG45 and SGE models, this motif runs along the back of the maple neck adding yet more flair to its design. From the gorgeous crown inlays, regal moustache bridge and tortoise flower pickguard, it knows it’s one classy son of a gun. Looks are not this guitar’s problem, but is it more than a peacock flashing its feathers? To the pleasure of this reviewer, it delivers the goods in spades. Made with a solid sitka spruce top with flamed maple back and sides, this combination makes for one hell of a sweet sound to your ears. Colourful, bright and bursting with character, the SG200 creates a unique tone that sits perfectly within the body of the guitar and projects with gusto. Perhaps not as loud as other similarly priced guitars, it can still deliver a strong sound when you need it the most. Strumming players will be in their element, but it’s the guitar that will help fingerstylists shine. With a nut width of 44.5mm, articulation is the ace up this guitar’s sleeve. Each pluck of the finger is brought to life with a warm tone that showcases the mid and lower frequencies that is accentuated with a sweet brightness. Don’t be afraid to go hard on this guitar either. The gold grover diecast tuners are sturdy as well as firm, keeping you in line to the fraction of a megahertz. Changing up the tuning is a breeze, as the machine heads work smoothly to your every turn. 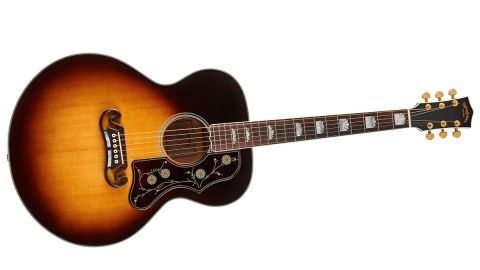 It’s equipped with a Fishman Sonitone preamp located just inside the body (just under the double rosette of the soundhole) – with a tone and volume dial available for some tweaking. Granted it doesn’t give you much in terms of wiggle room, but given how this guitar already sounds it isn’t an issue. Amplified it loses none of its colour or personality. Bigger, louder and uncut, every decibel is celebration of sound that will have you playing for hours on end. If you haven’t already guessed, this guitar doesn’t have many things going against it. Though it does lack an onboard tuner, which for the price you are paying would have been icing on the cake, we’re more than willing to forgive it. As a side note - if you like you’re a fan of mixing pedals with your electro-acoustic sound, the SG200 takes to the Boss DD-7 digital delay pedal with open arms. With the natural tonalities of the guitar mixed with some delicious delay, you can create some interesting and original sounds that you would not expect from a guitar such as this. Point being, this guitar encourages you to have a play around and to experiment with your sound. You’d be surprised what you may find, so we urge you to get playing around, sharpish! The SG series guitars are the underrated champions of their mid-priced realm. Not only is it refreshing to see guitars built with ambition in mind, but sharing that quality with the world is an unqualified luxury that shouldn’t be ignored.